The Wonderful World of the Maya is shown to you on a breathtaking tour underground, surrounded by Mayan sculptures and wonderful stalactites and stalagmites inside the caves and cenotes of this beautiful park. Explore swimming and refreshing in the mystical waters of the caves in the Mayan World and be a part of a place full of charm and natural beauty. 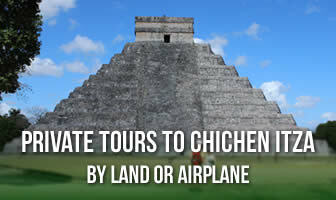 Kantun-Chi Mayan language means "Mouth of Yellow Stone." Enjoy this magical paradise, swim in the wonderful fresh water cenotes and explore our underground cavern with its exceptional natural beauty. The cenotes are impressive natural formations. A cenote is formed when acidic rainwater seeps through cracks in the limestone, dissolving the rock soft areas. 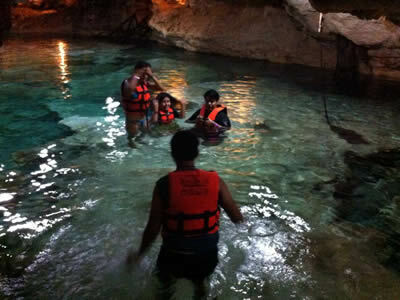 Down in this magical underground world, walk through the hallways, swimming in cenotes and enjoy one of the most incredible rides in the Riviera Maya. The cave consists of two cenotes connected by natural corridors .Inside the cave are beautiful natural formations called stalactites and stalagmites. An incredible flora and fauna: here you have a great concern for the environment and are working to preserve this natural habitat. The animals receive fresh fruits and vegetables every day, and keep the hard work is paying off. Beginning to show increases in the population of some of the endangered species within the park. 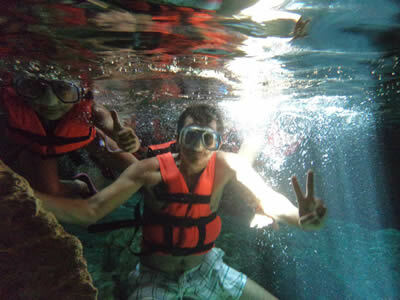 The ecological park Cenotes Kantun Chi provided water to the ancient Maya and native wildlife. The Mayans believed that the cenotes could purify their souls and before entering either a cenote to collect water for drinking or bathing, the Maya performed a ceremony to ask permission to the rain god: Chaac and aluxes. The aluxes beings with human traits were living in the jungle and hid from human sight, it is said that at night, when everyone was asleep, emerged from hiding and walked into the jungle. The Maya believed that if they were treated well, the aluxes protected jungle plants, animals, pests and other diseases but also away negative energies. In the park there are several cenotes Kantun Chi cavern. Currently only four of them are at your disposal for swimming, or just to admire. In order to protect fish and other wildlife that inhabit the cenotes, the use of any type of sunscreen or creams is prohibited. These four cenotes are: Kantun Chi: This semi open cenote is the first visit to the park, you can enjoy in a relaxing bath surrounded by beautiful tropical gardens. 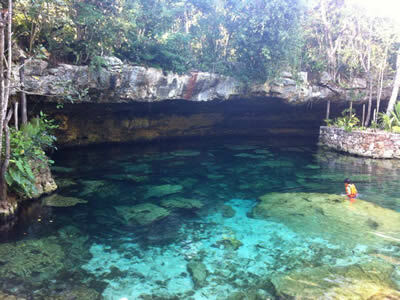 Saska has read: This is the largest cenote four and its name means "clear water" the second to find its way in a small shrine Maya probably used in purification ceremonies by the ancient Maya. Uch Ben Ha: It is a beautiful cenote open goldfish here you can snorkel and enjoy a pleasant rest in the hammock islands. Zacil Ha: This beautiful cenote which in Mayan means "clear water" light has tickets through the limestone, you can explore every nook and discover the beauty of the natural formations and clear waters. 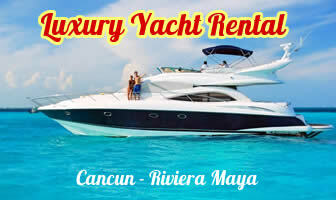 Kantun Chi is an easy drive via highway 307, just 90 km (56 miles) south of Cancun, 22 km (14 miles) from Playa del Carmen, and about 2 km (1 mile) south of Puerto Adventures. At the end of the tour of the park can enjoy a delicious meal of traditional Mayan cuisine, accompanied by the sounds of nature. 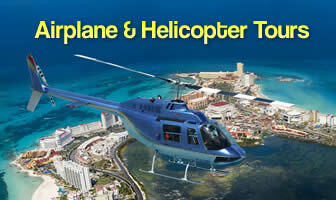 Relax your senses and become part of an extraordinary adventure ecotourism will remember forever.